In many ways, magnets are still mysterious. They get their (often powerful) effects from the microscopic interactions of individual electrons, and from the interplay between their collective behavior at different scales. But if you can't move these electrons around to study how factors like symmetry impact the larger-scale magnetic effects, what can you do instead? "The work was inspired by the question [of] how the magnetic interaction between nanoparticles influences the magnetic behavior of the system as a whole, since such array structures are used, for example, in high density storage media," said Alexander Fabian, lead author of the study from Justus-Liebig University Giessen in Germany. 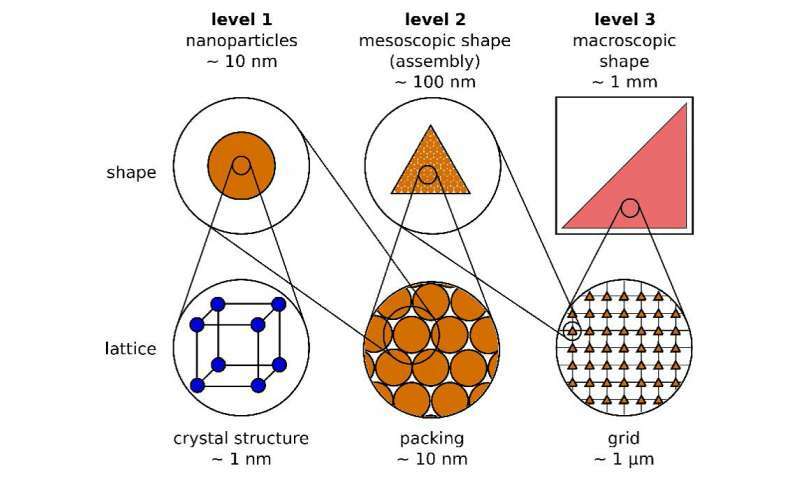 "To study the influence of [the] shape of the nanoparticle assemblies, as well as the distance between them, we came up with the idea of a hierarchical design of the samples where the corresponding parameters can be varied systematically." "For the preparation of the samples we used lithographic methods, which allow the precise control of the distance and the shape of the nanoparticle assemblies," Fabian said. "For each of the three hierarchical levels, there are two contributions, namely the lattice-like part and the shape-like part. The high number of possibilities in sample design makes this a challenging aspect to find systems with the most promising physical properties." "The symmetries of the lattice and the shapes were here chosen to not interfere with each other. For example, the circular shaped assemblies were combined with different types of lattices," Fabian said. "Assemblies of different shapes, such as triangles, squares or circles, exhibit an angle-dependence of the magnetic anisotropy (direction dependence) corresponding to the shape of the assembly." "Our results show that on the chosen length scales, only the shape of the assemblies influences the magnetic behavior, revealing that the assemblies of nanoparticles behave like a single bulk ferromagnet." Fabian said. "Most surprisingly was that the particles seem to behave like a bulk ferromagnet, but with a different magnetization value than that for bulk material, which is an interesting point for future investigations." "From a fundamental point of view, it is very interesting to investigate nano systems like nanoparticles. Since they can be fabricated in a very controlled manner, they can also be studied in a systematic approach. Properties of the nanoparticles different from the bulk, or even new properties like superparamagnetism, in nanoparticles make them also interesting for fundamental research."